The first season premiered on Netflix on June 10, 2016, and consisted of 13 episodes. The series had a 78-episode commitment from Netflix. It has been released globally in United States, Canada, United Kingdom, Australia, New Zealand, Ireland, France, Germany, Austria, Switzerland, Scandinavia, Benelux Union, Latin America, Slovenia, South Africa, Italy and Finland. The second season premiered on Netflix on January 20, 2017, and consisted of 13 episodes. The third season premiered on Netflix on August 4, 2017, and consisted of 7 episodes while the fourth season premiered on October 13, 2017, and consisted of 6 episodes. The fifth season premiered on March 2, 2018, and consists of six episodes. The sixth season premiered on June 15, 2018 and consists of seven episodes. A seventh season premiered on August 10, 2018 and consists of thirteen episodes. The series' success has spawned several comics, action figures, and other toys. The eighth and final season premiered on December 14, 2018, and consists of thirteen episodes. For millennia, the Galra Empire has plagued the universe by destroying other civilizations and enslaving various races. The only known threat strong enough against the empire's power and plans is the legendary "Defender of the Universe" Voltron, a 100-meter tall robot warrior composed of five lion mechas whose pilots are known as the Paladins. At the crux of the war that ended with the destruction of planet Altea, Voltron was separated by King Alfor of Altea in order to protect Voltron from falling into the Galran evil Emperor Zarkon's possession. King Alfor bonded the five lion's energies to his daughter Allura's life force and sent them across the universe to different locations until the time for the next generation of Paladins to appear and pilot Voltron arrived. Princess Allura, her royal adviser Coran, and the Altean Castle of Lions were hidden on planet Arus along with the Black Lion. In the present, the Galra Empire's path of conquest and search for Voltron has led them to Earth's solar system. A group of space pilots – Shiro, Keith, Lance, Pidge, and Hunk—discover the Blue Lion and immediately get swept up into the Galran War. They meet Princess Allura, become the new Paladins, and reunite the five lions to form Voltron, beginning their fight to liberate the universe from the Galra Empire. Josh Keaton as Lieutenant/Commander Takashi 'Shiro' Shirogane—the Black Paladin and the pilot of the Black Lion. The Leader of the Defenders of the Universe, Shiro was captured by the Galra Empire a year before the start of the series during which he was given a weaponized prosthetic right arm. A natural, decisive leader, Shiro is calm and always in control. At the end of the second season, Shiro reclaims his personal bayard weapon from Zarkon that enables them to defeat him, but Shiro mysteriously vanishes afterwards. In season three, it is revealed he was teleported to a Galra ship, as he ended up on one before escaping and was eventually found by the team. After finding that the Black Lion no longer accepts him as its true paladin, he continues to aid the team by providing guidance and support to them from the Castle of the Lions. At the start of season four, Shiro manages to re-establish his bond with the Black Lion when Keith was absent during an intense battle. In season five, he has become an unwitting mole of Haggar, who can see through his eyes to keep an eye on Lotor. After Keith and the Altean Romelle revealed Lotor's true intentions, Haggar takes full control over Shiro, and Keith discovers that the Shiro with them is a clone, while the true Shiro died during the fight at the end of season two and his soul lies inside the Black Lion. Afterwards, Shiro is revived when Allura uses her powers to transfer his soul from the Black Lion to the clone's body. In season 7 following his return to Earth, he becomes the captain of the Atlas, a Garrison battleship and joins the fight against Sendak. The first episode introduces the character "Adam W." who was shown as a "significant other" to Shiro, a description confirmed by Lauren Montgomery that revealed Shiro as an LGBT character. At the end of season 8, he married Curtis, a fellow crewmember on the Atlas. In the Japanese dub, Shiro is voiced by Kenji Sugimura. Steven Yeun as Keith—the Red Paladin and the pilot of the Red Lion. Formerly a cadet at Galaxy Garrison academy before being expelled, Keith is an orphan and a lone wolf as a result. Sullen and temperamental, Keith spends his free time honing his skills for battle. In season two, Keith discovers he has Galra blood, apparently from his maternal side of the family. The revelation comes from a knife which associated him with a secret rebel group of the Galra called the "Blade of Marmora", but also ends up straining Allura's trust in him for a while. Due to Shiro's absence, Keith takes over as the head of Voltron as the new pilot of the Black Lion in season three. At the start of season four, Keith officially steps down as the leader of Voltron, handing the position back to Shiro so that he can continue to work with the Blade of Marmora. At the end of season five, Keith is reunited with his Galra mother, Krolia. He rejoins the Paladins in the end of season six, re-assuming command of the Black Lion. At the end of season 8, he dissolves the Galra Empire and transitions the Blades of Marmora into a humanitarian organization. In the Japanese dub, Keith is voiced by Anri Katsu. Jeremy Shada as Lance—the Blue Paladin and the pilot of the Blue Lion. Lance was the fighter pilot of his team at Galaxy Garrison academy. Cocky and confident, Lance is the comic relief of the Defenders and likes to think of himself as a ladies' man as well as the sharpshooter. Lance has maintained a one-sided rivalry with Keith from when the two were at the Galaxy Garrison together, but the two have shown to be an effective team. Lance becomes the new pilot of the Red Lion from season three onward. He and Allura begin a romance at the beginning of season 8. After the final battle with Honerva, Lance returns to life on his family’s farm, spreading Allura’s message. In the Japanese dub, Lance is voiced by Takamasa Mogi. Bex Taylor-Klaus as Katie "Pidge Gunderson" Holt—the Green Paladin and the pilot of the Green Lion. Katie disguised herself as a boy named Pidge Gunderson to get into Galaxy Garrison academy to find out what happened to her father and brother who disappeared whilst on the same mission which Shiro was captured on. A technical genius, Pidge is the smartest member of the team, able to create specialist modifications for the Green Lion such as a cloaking device. She also re-purposed a Galran drone to work for her, naming it Rover, who later sacrificed itself to protect her. During her time as a Paladin, she eventually rescued her brother, and then her father. Her brother Matt, kept fighting for a rebel group, and her father, Samuel, returned to Earth to warn the Galaxy Garrison about the impending war against the Galra. After the final battle in Season 8, she and her family help lead the next generation of Legendary Defenders (a nod to Vehicle Voltron). In the Japanese dub, Pidge is voiced by Kana Omata. Tyler Labine as Hunk—the Yellow Paladin and the pilot of the Yellow Lion. Hunk was the engineer of his team at Galaxy Garrison academy. A gentle giant with an equally large appetite, Hunk is the heart of the team, lifting them up and making peace between them. After witnessing first hand the devastation and misery that Zarkon's conquest of the universe has brought upon the people of various worlds, Hunk is determined to free those enslaved. Following the final battle with Honerva, he starts up a culinary empire to bring worlds together, one meal at a time. In the Japanese dub, Hunk is voiced by Toshifumi Nakabayashi. Kimberly Brooks as Princess Allura—Crown Princess of Altea, the daughter of King Alfor, Allura was the last known female Altean. Pilot and keeper of the Castle of Lions, a structure that is both a castle and a spaceship, Allura granted the Defenders their titles and sent them on their mission to defeat Zarkon and liberate the universe. Allura wishes more than anything to finish her father's work in stopping Zarkon. In season three, she becomes the new pilot of the Blue Lion as the new Blue Paladin. As an Altean, Allura's abilities include the chameleon-like ability to blend in with other species and magical abilities related to quintessence. She has a telepathic bond with some Altean mice that had ended up in the same cryo-pod that she was hibernating inside of. During season 8 Allura and Lance engage in a romantic relationship and Lance starts to be more protective and caring towards her. At the end of season 8, she and Honerva give their lives to restore realities after they were destroyed in the final battle. In the Japanese dub, Allura is voiced by Yui Shimodaya. Rhys Darby as Coran Hieronymus Wimbleton Smythe – The Royal adviser to Princess Allura's family, Coran is the last known male Altean. Energetic and excitable, Coran serves Allura dutifully whilst being fiercely protective of her. He tends to ramble on and on about his past, particularly about his supposedly daring feats or past experiences. Despite his odd and quirky character, he is a reliable and steadfast ally to his princess and the Paladins. Neil Kaplan as Emperor Zarkon—the Emperor of the ruthless Galra Empire, and the ruler of most of the known universe after spending the last ten thousand years conquering it. He desires the Lions of Voltron, whom he is powerful to contend against, due to both the threat they pose to campaign along with the revelation that he was the former Black Paladin that motivates his claim of the Lions as his own property. During the season two finale, Zarkon faces Voltron and the Paladins in an experimental mecha armor and is defeated but left in a coma for most of season three until he was revived by Haggar and begins a manhunt for Lotor. In season five, Lotor has slain him in a duel to the death, and he is declared dead by the empire. In season 8, Zarkon last appeared in his original state as a soul placed inside of Honerva's mind to protect her deepest desires. After Allura has shown him all the suffering he caused, he has become repentant and they convince him to help the current and past Paladins escape her mind using their shared bond to Voltron. Cree Summer as Witch Haggar—Zarkon's primary adviser, and leader of the Druids, dark mystics who fanatically serve the Galra Empire. Haggar is both a dangerous sorceress and a mad scientist. She combines her dark magic with abominable science to arm soldiers with powerful weapons, create giant monsters later called "Robeasts" to fight Voltron, and drain the mystical energy known as quintessence from all manner of living things, including whole planets, for the Galra to use in their conquest of the universe. In battle, her magical abilities allow her to teleport, cast illusions, and channel dark magical energy. Haggar is eventually revealed to be an Altean alchemist named Honerva, Zarkon's wife who played a role in Voltron's origins ten millennia ago. While afflicted by the same corruption that transformed Zarkon, Haggar lost all the memories of her former life, and gradually recovered them as she traveled the mystical realm of Oriande where Altean alchemy originated. The trip restores Haggar to her original state as Honerva. She mysteriously disappeared during season 7. Honerva returns as the main antagonist of season 8. Her plan is to use Lotor's mech, merge it with hers, and open rips to alternate realities so she could find the perfect one to live in peace with, disregarding the risk of all other universes being destroyed in the process. She nearly succeeds in ending all of existence in the final battle, but is convinced by the Paladins and Allura to stop, though she is disheartened that there is only one reality left because of her actions. She and Allura work together to use all their magic in order to save all of existence, sacrificing their lives in the process. A.J. Locascio as Prince Lotor—the son of Zarkon and Honerva, making him a Galra-Altean hybrid. He assumed control of the Galra Empire following his father's inability to lead while in critical condition. Possessing a Messianic complex, Lotor's ideology that strength comes from worthy followers from conquered worlds, rather than resource expansion and subjugation, is reflected in his personal all-female strike team who are half-Galra like himself. While acting as ruler, ignoring matters that he deems a waste of time, Lotor has been working on his own plans to obtain Quintessence which results with him branded an outlaw by Zarkon once he returns to power. Forming an alliance with the Paladins after saving them from Haggar's ambush, Lotor manages to win back the Galra throne after defeating his father in a battle to the death and subsequently dealing with insurgents, but Lotor's alliance with the Paladins falls apart once it is revealed that he secretly saved many Alteans at the time during the past war, hiding them away and allowing them to thrive, only to sacrifice a majority of them so he can use their harvested quintessence for his plans, as revealed by Keith and the an Altean from his colony, Romelle. It is eventually revealed that Lotor's goal is to establish a new Altean Empire, one that will even span across other realities, and he will dispose of anything, even his own forces if need be, to accomplish this, as he fights Voltron using his own giant robot formed from his Sincline ships, which has the ability to enter the Quintessence field at will. As the fight enters the Quintessence field itself, the exposure to all that quintessence drives Lotor mad with power, just like Zarkon, but Lotor is defeated when Allura has Voltron use all of its power, both from itself and the constant power it gets from Quintessence field, against him. As the power makes Voltron increasingly difficult to keep together, they are forced to abandon Lotor in the Quintessence field. He later died due to Quintessence poisoning. On January 5, 2016, Netflix and DreamWorks Animation announced a new original animated Voltron series to debut in 2016 as an expansion of their existing multi-year agreement. Voltron was one of several series planned for initial development and debut in 2016, including Guillermo del Toro's animated Trollhunters. Lauren Montgomery and Joaquim Dos Santos, both known for their work on the Avatar: The Last Airbender and its sequel The Legend of Korra, served as showrunners while fellow crew member Tim Hedrick served as head writer. On March 25, 2016, at WonderCon it was announced that the voice cast would consist of Steven Yeun as Keith, Jeremy Shada as Lance, Bex Taylor-Klaus as Pidge, Josh Keaton as Shiro, Tyler Labine as Hunk, Kimberly Brooks as Princess Allura; and Rhys Darby as Coran and Neil Kaplan as Emperor Zarkon. Cree Summer later confirmed that she would be voicing Witch Haggar. The first season premiered on June 10, 2016, and consisted of 13 episodes. It was announced at San Diego Comic-Con that season two will premiere on Netflix in late 2016. A few months later, at New York Comic Con, it was announced that the second season will premiere on January 20, 2017. The second season saw a special premiere at the New York Comic Con in October 7, 2016, where an episode was shown at the Voltron panel. The second season premiered on Netflix on January 20, 2017, and consisted of 13 episodes. The third season premiered on Netflix on August 4, 2017, and consisted of 7 episodes. The fourth season premiered on October 2017, and consisted of 6 episodes. The series was revealed at WonderCon 2017 to have a 78-episode commitment from Netflix. The fifth season premiered on March 2, 2018, and consisted of 6 episodes. The sixth season premiered on June 15, 2018, and consisted of 7 episodes. The seventh season premiered on August 10, 2018, and consisted of 13 episodes. The eighth and final season premiered on December 14, 2018, and consisted of 13 episodes. Voltron: Legendary Defender has received widespread critical acclaim throughout its eight season run. Reviewers and a number of fans have lauded the series’ plot and story arc. However, a number of critics and fans levied criticism at the series for its handling of its LGBT representation. Additionally for most of its run, the series was plagued by poor behavior by a subset of its fans, with a number of fans issuing death threats to both the cast and crew, including Dos Santos and Montgomery, over decisions and reactions related to representation and “shipping” interests. A petition launched on Change.org demanding justice for Emperor Zarkon. The review aggregator website Rotten Tomatoes reported a 100% approval rating for the first season, based on 11 reviews, with Critic Consensus being that "Voltron: Legendary Defender honors its source material with beautifully expressive animation and impactful action." Season 8 also received critical acclaim with a 86% reported from Rotten Tomatoes based on seven reviews. In reviewing the final season, Jesse Schedeen of IGN wrote, "Minor storytelling quibbles aside, the final season of Voltron: Legendary Defender captures pretty much everything that has made this series great. The action scenes are fantastic. The story combines humor and character drama better than any season before it. These 13 episodes tie up nearly every loose end on a satisfying note and raise the stakes of the show higher than ever." He rated the season 9.1 out of 10, though he admits, "That said, it would be far more effective to see one of these animated shows acknowledge their LGBT heroes from the very beginning and not save moments like these for the literal last minute; with that rushed reveal (after spending no time establishing Shiro's new relationship or even hinting at it), Voltron relies too much on the audience's affection for Shiro to give the moment resonance, rather than earning an emotional response from its storytelling." Dave Trumbore of Collider gave the season a perfect score, writing, "The final season of Voltron Legendary Defender rarely stumbles; the same can be said of the series’ story overall. Honestly the only shortcoming in the storytelling has to do with the way the narrative has handled romantic relationships; that trend continues here. Overall, Season 8 manages to do the seemingly impossible by ramping up the stakes to the utmost, delivering the most powerful emotional resonance between our heroes and villains yet, and wrapping everything up in a tearful, bittersweet, and fully satisfying way. It’s not perfect, but it’s as close to perfection as we’re going to get in this reality." Shamus Kelly from Den of Geek gave the season a 4 out 5 stars, writing, "The biggest strength of the season is how nearly everyone comes back to play some part in the final season." Palmer Haasch of Polygon had praised the series, though she criticized the series' LGBT representation. She noted "The final sequence of the series, like any button on a series finale, was a mixed bag. It was a relief to see Lance reunited with his family; Hunk’s establishing a diplomatic culinary empire is nothing short of a perfect arc” concluding, "Ultimately, Voltron, the vision and artistic pursuit of its creators, was never going to quell the concerns of its fanbase. But taken on its own storytelling merits, the final season remained true to the ideas of found family, collective spirit, and empathetic connection. Voltron: Legendary Defender was an honor to follow, and it’s certain that the series will be remembered both for its compelling narrative and spirited fandom for years to come." There were however a number of negative or lackluster reviews, mostly revolving around Shiro's wedding scene and for killing off Allura. The Geekiary's Jamie Sugah stated in her official series finale, "On the whole, though, this is a lackluster ending for what had up until now been a well-written show with strong, well-developed characters. Voltron season 8 felt very rushed and out of character, with a poorly thought out and clearly tacked on ending." The Official Voltron Podcast, Let's Voltron, stated, "Allura's death, as I saw it for a long time, really, really bothered me. I've got to be frank about it. As a father of a seven year daughter, for a TV-Y7/FV show, to kill off one of the few female prominent characters? I mean we've got a lot of strong secondary characters, but among the paladins it's Allura and Pidge and that's it, it bothered me a lot. To me it's a difficult pill to swallow. To me it came entirely out of left field. I kept me trap shut on social media, but I was bothered by it a lot." When speaking of Lotor's death, "I think it was little rough for children. I literally rechecked the ratings of the series when I saw that happen, and it's TV-Y7/FV... but seeing his body there—it's just. We didn't have to see it there, did we?" In regards to Shiro's wedding, "We were told that any kind of relationship developed, it was gonna happen naturally and stuff like that, and obviously this didn't really happen naturally." While the series featured five LGBT characters (Shiro, Curtis, Adam, Ezor and Zethrid) and depicted the first on-screen wedding between two male characters on a Western children’s animated series, much of the series’ controversy swirled around the show’s LGBT representation, with most of the criticism levied at the show’s treatment of its LGBT characters. After the release of Season 7, controversy arose after the death of Adam, Shiro's ex-boyfriend. A number of fans and critics were displeased that Adam, a gay character and Shiro’s ex-boyfriend, died in Season 7. Controversy also swirled around the on-screen wedding between Shiro and Curtis, with a number of critics and fans characterizing it as poor LGBT representation. While Polygon reviewer Palmer Haasch praised the shows general plot, she criticized the shows depiction of Shiro and Curtis’ stating “Shiro’s nuptials feel abrupt given that we’ve barely seen him and his husband Curtis, a member of the Atlas bridge crew, interact in any meaningful capacity over the course of the season. Following Voltron’s queerbaiting controversy following the death of Shiro’s ex-boyfriend, Adam, the ending felt neutrally affective at best and disingenuous at worst, despite being a groundbreaking moment for LGBTQ representation in all-ages programming.” ". Schedeen of IGN wrote, "That said, it would be far more effective to see one of these animated shows acknowledge their LGBT heroes from the very beginning and not save moments like these for the literal last minute; with that rushed reveal (after spending no time establishing Shiro's new relationship or even hinting at it), Voltron relies too much on the audience's affection for Shiro to give the moment resonance, rather than earning an emotional response from its storytelling." Sean Z. of Geekdad wrote, "The fact is: the wedding is a PR stunt–one that reduces queer people to marketing collateral and attempts to sell a last-ditch effort as 'groundbreaking.' That is why the scene is so reprehensible: the studio expects to be rewarded for it." Criticism of editing primarily regarded LGBT issues, though some were general observations. On October 22, 2018, a series of leaks of the final episode appeared online of the wedding, in which a different character was seen marrying Shiro. It remains unclear whether the leaks are authentic. Further controversy followed with the release of the final season, where Shiro is married to Curtis. In the English audio description, Curtis is referred to as Adam though he is once mentioned to be Curtis in the closed captions of a different episode. The error has since been corrected, but a number of fans have noted this as "evidence" of the “tacked-on” nature of the epilogue. The supervising producer, episode director, storyboard artist, and animator Kihyun Ryu posted on his instagram on September 12 a piece of Shiro material, weeks before the season was sent to be dubbed into other languages. In the comments, the show runners tell him to "make it beautiful." The voice actor of Shiro’s husband, Blake Michael, was so perplexed by Shiro's husband that he asked a fan who the husband was. In the final two seasons, the fandom noted a wide variety of inconsistencies, such as audio descriptions not describing characters or scenes accurately, random and jarring music jumps. The fandom dubbed this the 'cut and paste conspiracy,' owing to issues of dialogue, animation, and characterization that raised the question of whether the last two seasons may have existed as a complete version that was heavily edited and rearranged into the final version. 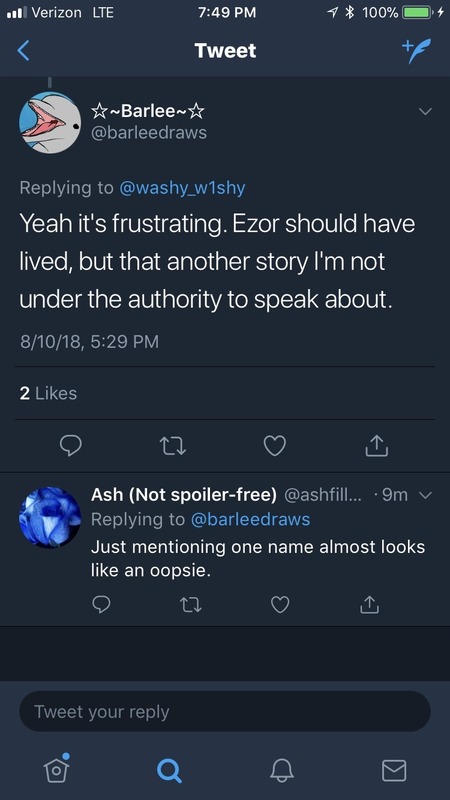 Carli Squitieri, the storyboard revisionist on "The Grudge", stated on social media after the release of Season 7, "Ezor should have lived, but that's another story I'm not under the authority to speak about." With additional information from Kihyun Ryu concerning the added-on epilogue created just weeks prior to broadcast, fans began a petition for the alleged original season (the version that supposedly existed prior to severe editing), to be released. The petition has garnered over 29,000 signatures. Three comic series detailing events happening in between episodes were announced in January 2016. Taking story ideas that were deemed too outlandish and too epic to be contained in a 23-minute episode from the animated series, these comic series bridges the time lapse between seasons. The first miniseries consisted of five issues, published by Lion Forge Comics. It was written by show head writer Tim Hedrick and Mitch Iverson, and illustrated by Digital Art Chefs. A special cover variant of issue #1 was available at San Diego Comic-Con in 2016, with a limited release of 250 copies. Issue #2 was released on August 2, 2016, followed by issue #3 on October 5, 2016, issue #4 on November 9, 2016, and issue #5 on November 20, 2016. The whole series will be collected in a graphic novel and was initially scheduled for a December 2016 release, but got pushed back to January 3, 2017, then was finally released January 25, 2017, according to Lion Forge. The second series will be announced after the release of the graphic novel. A motion comic of issue 1 with full voice acting by the series cast was released on June 15, 2017, at the DreamWorksTV YouTube channel. The story takes place in between the season 1 episodes "Rebirth" and "Crystal Venom." During the Voltron: Legendary Defender panel at WonderCon 2017, it was announced that the second series of five issues would debut in May 2017. The date was pushed back to late June due to production delays., however the date was pushed back on October 4, 2017 where was published where issue 2 and 3 was published on the same day, November 1, 2017 and issue 4 was published on November 15, 2017, issue 5 was published on December 13, 2017, the Vol. 2 Trade Paperback was published on January 31, 2018. The story takes place in between the season 2 episodes "Shiro's Escape" and "Greening the Cube." Volume 3 debuted on July 11, 2018. The story is set between season 4 and season 5. The first two seasons were released on DVD in Region 1 by Universal Pictures Home Entertainment on June 12, 2018, The first two seasons were also released in Australia on October 17, 2018. The series also scheduled for DVD releases in the UK, Italy, and Germany. To promote the series in between the release of season 1 and 2, a Robeast fanart contest was announced via social media on October 18, 2016. The winner was announced on December 27, 2016 on social media under the username "Zilla B". A virtual-reality video game based on the series, known as Voltron VR Chronicles, was released for Steam, Oculus and PlayStation 4 via PlayStation Network. ^ "Voltron: Legendary Defender". Netflix Media Center. Retrieved June 12, 2016. ^ "Watch Voltron Online | Netflix". www.netflix.com. Retrieved April 26, 2016. ^ a b c Serrao, Nivea (October 7, 2016). "Voltron: Legendary Defender announces season 2 release date". Entertainment Weekly. Retrieved October 7, 2016. ^ a b Kelley, Shamus (February 20, 2017). "Voltron Season 3 Confirmed". Den of Geek!. Retrieved February 23, 2017. ^ "'Voltron: Legendary Defender' Season 5 Release Date Revealed". TV Shows. Retrieved February 2, 2018. ^ "New Trailer for "Voltron Legendary Defender" Season 5, Streaming Starting March 2, 2018". Toonzone. Retrieved February 16, 2018. ^ "'Voltron' Season 6 Release Date Confirmed!". Collider. Retrieved March 3, 2018. ^ "Voltron Season 7 Release Date and Everything We Know". Den of Geek. Retrieved July 15, 2018. ^ a b "Voltron: Legendary Defender #1". LionForge.com. Lion Forge Comics. Archived from the original on January 3, 2017. Retrieved January 30, 2017. ^ "Playmates Voltron Legendary Defender 14" Electronic Voltron". Voltron.com. Retrieved June 16, 2017. ^ "Voltron: Legendary Defender Animated Series to End This Year With Season 8". Anime News Network. Retrieved July 21, 2018. ^ a b "'Voltron' Season 8 Release Date, Synopsis Released". Anime. Retrieved October 5, 2018. ^ Romano, Nick (August 9, 2018). "How Voltron showrunners found a Legendary LGBTQ Defender in Shiro". Entertainment Weekly. An episode screened for the crowd glimpsed a flashback scene involving Adam, Shiro’s former “flight partner” in the Galaxy Garrison who became something more. “He is Shiro’s significant other,” Montgomery told the room. “They weren’t married yet, but that’s the road they were going down” — that is, until Shiro “made the unfortunate decision” to go to space. ^ Hoffer, Christian (July 20, 2018). "'Voltron: Legendary Defender' Paladin Confirmed as LGBT". comicbook.com. During today's panel, showrunner Lauren Montgomery noted that viewers would meet Adam, Shiro's significant other, during the seventh season of the show. The two men were heading towards marriage, but Shiro broke things off to join the Kerebos mission instead. ^ Leighton-Dore, Samuel (July 24, 2018). "Netflix's Voltron: Legendary Defender confirms lead character is gay". SBS Sexuality. ^ "Netflix and DreamWorks Animation Expand Global Relationship". Netflix Media Center. January 5, 2016. Retrieved April 26, 2016. ^ Barder, Ollie (January 6, 2016). "Netflix And DreamWorks Are Working On An Animated Reboot Of 'Voltron'". Forbes. Retrieved April 26, 2016. ^ "DreamWorks and Netflix reveal Voltron: Legendary Defender animated series showrunners". Nerd Reactor. Retrieved April 26, 2016. ^ Nicholson, By. "WonderCon: Netflix's Voltron Animated Series – Release Date Set, Voice Cast Announced". IGN. Retrieved April 26, 2016. ^ "Cree Summer will voice Haggar the Witch". Retrieved May 1, 2016. ^ Phillips, Jevon (July 24, 2016). "'Voltron: Legendary Defender' gets a second season on Netflix". Los Angeles Times. Retrieved August 20, 2016. ^ Lesnick, Silas. "DreamWorks Animation and Netflix Head to New York Comic-Con". comingsoon.net. Retrieved September 26, 2016. ^ "Voltron Legendary Defender Season 4". Dreamworks. July 20, 2017. Retrieved July 21, 2017. ^ "Voltron Season 8: Everything We Know". Den of Geek. August 23, 2018. Retrieved September 18, 2018. ^ "Voltron Legendary Defender Rotten Tomatoes". Rottentomatoes.com. Retrieved July 17, 2016. ^ "Voltron Legendary Defender Rotten Tomatoes". Rottentomatoes.com. Retrieved January 22, 2019. ^ a b Schedeen, Jesse (December 23, 2018). "Netflix's Voltron: Legendary Defender - Season 8 Review". IGN. Retrieved January 26, 2019. ^ Trumbore, Dave (December 17, 2018). "'Voltron' Final Season Review: The Series' Biggest Bad Is Revealed at Long Last". Collider. Retrieved January 26, 2019. ^ "Voltron Season 8 Review". Den of Geek. Retrieved January 26, 2019. ^ a b c Haasch, Palmer (December 19, 2018). "The thrilling ending of Voltron was never going to deliver on fan demands". Polygon. Retrieved January 27, 2019. ^ "The Geekiary Official S8 Review". thegeekiary.com. Retrieved January 25, 2019. ^ "Let's Voltron Official Podcast Review of S8". letsvoltron.com. Retrieved January 26, 2019. ^ "Screenrant Voltron Season 7 LGBT Backlash Response". screenrant.com. Retrieved January 26, 2019. ^ "Voltron's Final Season Doesn't Make Up For Its LGBT Problem". cbr.com. Retrieved January 26, 2019. ^ "Voltron Legendary Defender Review for Season 8". Geekdad.com. Retrieved January 22, 2019. ^ a b c "A By-The-Numbers Look At The Disaster That Was 'Voltron' Season 8". thegeekiary.com. Retrieved January 26, 2019. ^ "Voltron S8 Epilogue Clip". twitter.com. Retrieved January 25, 2019. ^ "Kihyun Ryu's instagram". instagram.com. Retrieved January 26, 2019. ^ "Blake Michael's Instagram". instagram.com. Retrieved January 26, 2019. ^ "Ezor's only spoken line". vimeo.com. Retrieved February 17, 2019. ^ "Was Season 8 Tampered with". vimeo.com. Retrieved February 17, 2019. ^ "Carli Squitieri's twitter". twitter.com. August 10, 2018. Retrieved February 17, 2019. ^ Hipes, Patrick (November 28, 2016). "'Zootopia' Leads Annie Awards Nominations". Deadline. Retrieved December 31, 2016. ^ "And the 2017 Kidscreen Awards winners are…". February 14, 2017. ^ "Best Animated Series – Best of 2016 Awards – IGN". IGN. Retrieved December 5, 2017. ^ "2016 BTVA Voice Acting Awards". Behind The Voice Actors. Retrieved December 5, 2017. ^ "Best Animated Series – Best of 2017 Awards – IGN". IGN. Retrieved December 8, 2017. ^ "And the 2018 Kidscreen Awards go to…". Retrieved February 14, 2018. ^ "2017 BTVA Voice Acting Awards". Behind The Voice Actors. Retrieved June 19, 2018. ^ "The 2018 ComicBook.com Golden Issue Award for Best Animated TV Series". Anime. Retrieved December 20, 2018. ^ Staff, I. G. N. (December 10, 2018). "Best Animated TV Series - 2018". IGN. Retrieved December 12, 2018. ^ a b c "Voltron Legendary Defender Graphic Novel initial date". Dreamworks. Retrieved July 17, 2016. ^ "Voltron Legendary Defender Comic SDCC Cover Variant". Comicsalliance.com. Archived from the original on July 30, 2016. Retrieved August 13, 2016. ^ "Voltron Legendary Defender Comic Issue#2 Release Date". Lionforge Comics. Retrieved August 29, 2016. ^ "Voltron Legendary Defender Comic Issue#3 Release Date". Lionforge Comics. Retrieved September 26, 2016. ^ "Voltron Legendary Defender Comic Issue#4 Release Date". Lionforge Comics. Retrieved November 7, 2016. ^ "Voltron Legendary Defender Comic Issue#5 Release Date". Lionforge Comics. Retrieved December 7, 2016. ^ "Voltron Legendary Defender Trade Paper Back Release Date". Lionforge. January 11, 2017. Retrieved December 21, 2016. ^ "Voltron: Legendary Defender – Volume 1 Trade Paperback Release Date". Lionforge. January 25, 2017. Retrieved January 30, 2017. ^ [MOTION COMIC] Shakedown at the Fripping Bulgogian DREAMWORKS VOLTRON LEGENDARY DEFENDER (Motion comic). DreamWorksTV. June 15, 2017. ^ "Voltron: Legendary Defender #2". LionForge.com. Lion Forge Comics. Archived from the original on March 27, 2017. Retrieved January 30, 2017. ^ "Voltron: Legendary Defender #3". LionForge.com. Lion Forge Comics. Archived from the original on March 27, 2017. Retrieved January 30, 2017. ^ "Voltron: Legendary Defender #4". LionForge.com. Lion Forge Comics. Archived from the original on March 27, 2017. Retrieved January 30, 2017. ^ "Voltron: Legendary Defender #5". LionForge.com. Lion Forge Comics. Archived from the original on June 21, 2017. Retrieved January 30, 2017. ^ "Voltron: Legendary Defender – Comic Series 2 Announcement". Lionforge. April 1, 2017. Retrieved April 2, 2017. ^ "Voltron Legendary Defender Comic Series 2 new Release Date". Lionforge Comics. May 26, 2017. Retrieved June 10, 2017. ^ "VOLTRON LEGENDARY DEFENDER VOL 3 #1 CVR A YAMASHIN (MAY181839)". Retrieved May 22, 2018. ^ "Voltron: Legendary Defender – 'Seasons 1 & 2' of the Current Show are Soaring to DVD Soon!". TVShowsOnDVD.com. April 5, 2018. Retrieved April 5, 2018. ^ "Robeast contest announcement". Voltron.com. October 18, 2016. Retrieved December 31, 2016. ^ "Robeast contest announcement". Voltron.com. December 27, 2016. Retrieved December 31, 2016. This page was last edited on 21 April 2019, at 05:42 (UTC).